Coletta Teske is a freelance writer focusing on consumer electronics. She writes articles, how-tos, newsletters, training manuals and white papers. Wireless printers use your Wi-Fi network to print from your laptop. With a wireless printer, your laptop isn’t attached to a printer cable and files can be sent to the printer from any room in your home or office. When you’re away from your Wi-Fi, your wireless printer may be able to print files you email to it. Find out how to print wirelessly. Instructions in this article apply to wireless printers connected to laptops running Windows 10, 8, or, 7. Wireless printers work over a network connection. If you use the printer at home, this would be your wireless internet connection. If you work in an office, it’s your office network. The directions for connecting your wireless printer to your Wi-Fi network vary depending on the manufacturer. So, before you begin, read the printer manual and follow the manufacturer directions to connect the printer to a Wi-Fi network. Some printer manufacturers supply a software wizard that automates the process of connecting the printer to a Wi-Fi network. Power on the Wi-Fi router and the laptop. On the printer control panel, go to the wireless setup settings. If you use an Epson printer, navigate to Setup > Wireless LAN Settings. If you have an HP printer, go to Network. Select the wireless SSID of the Wi-Fi network. Enter the Wi-Fi security password. The password is the WEP key or WPA passphrase for the router. The wireless light on the printer will turn on when the printer connects to the Wi-Fi. Connect the printer to the laptop with a printer cable or USB cable. If the laptop prints to the printer with the cable, the printer may not be able to connect to the Wi-Fi. Move the printer to get a better Wi-Fi signal. Something may be blocking the printer’s access. Check the printer display for the Wi-Fi strength; some printers do not have this feature. Clear any pending print jobs. There may be a problem with a document that blocks the printer’s ability to connect to the Wi-Fi. Make sure the printer’s firmware is up-to-date. After the printer has access to the Wi-Fi network, add the wireless printer to your laptop. Open the Windows Search text box and type "printer." In the Settings window, select Add a printer or scanner. Wait while Windows sets up the necessary drivers and adds the printer to the laptop. Windows may prompt you to install additional software. If so, select Get app to download and install the software from the Microsoft Store. 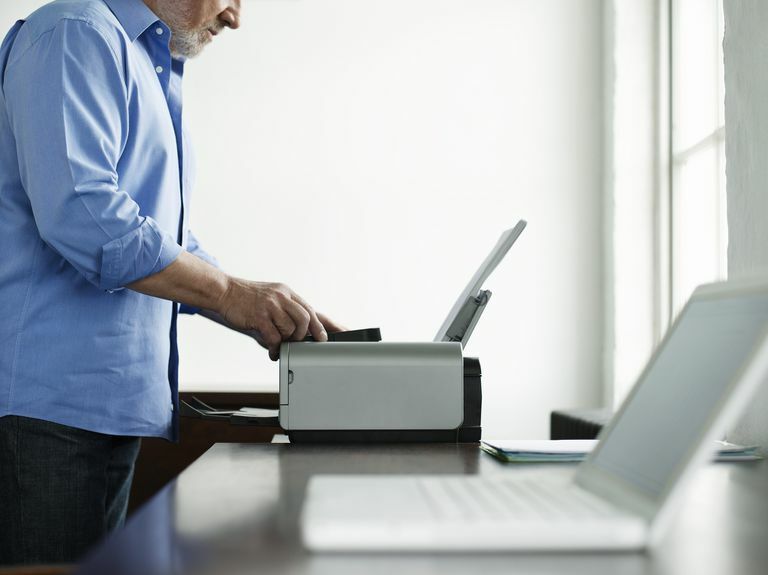 When the setup is complete, the laptop prints to the wireless printer without being connected to the printer with a USB or printer cable. If Windows didn't recognize the printer, go back to Printers & Scanners. If Windows is unable to find the printer, make sure the laptop and printer are using the same network. If you use a Wi-Fi Range Extender, the extended area is a second network. Select Add a printer or scanner. Select The printer that I want isn’t listed. Select Add a Bluetooth, wireless or network discoverable printer. Close the Settings when you’re finished. Go to Start and select Devices and Printers. In the list of available printers, select the printer. Windows may need to install the printer driver. If so, select Install driver to continue. Select Finish when you’re done. Printing from your laptop to a wireless printer is the same as printing from any device to any printer. Make sure the printer is powered on, is connected to the Wi-Fi, and has paper in the paper tray. Open the app or web browser for the document you want to print. Change the print settings as needed. The printed pages will be waiting for you in the printer output tray. Some printer manufacturers offer an email print service. When you sign up at their website, the printer is assigned an email address. You’ll use this email address to send the document to your printer. When you’re away from home or out of the office, it’s possible to print a document on your wireless printer. The email address may be found by searching through the printer’s menu. On an HP printer, look for HP ePrint. Make sure the Wi-Fi router is powered on, the printer is powered on and connected to the Wi-Fi, and there is paper in the printer tray. Open your favorite email app. In the To text box, enter the email address the manufacturer assigned to the wireless printer. For the subject, enter a description of the print job. Some email print services require a subject. If there's no subject, the print job is canceled. Attach the document you want to print. The email print service may limit the size and number of attachments. Also, the supported file types may be limited. Type a message if you want to print a separate sheet with information about the document, or other instructions. The file is sent to the wireless printer and printed.